2016 Spring Summer Newsletter Get the newsletter before it is posted on the site! Become a Member and checkout our newsletter archive. 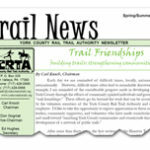 Our mission is to enrich York County communities and countryside through the development of a network of public trails. Copyright © 2019 York County Rail Trail Authority.